Our tissue typing laboratory has evaluated new techniques in tissue typing. One year patient survival at Montefiore Medical Center is among the best in the region (96 percent), and the 1992 and 1994 Center Specific reports lists Montefiore as one of the very few U.S. centers with a risk-adjusted survival rate significantly above that expected. Our current transplant rate is approximately two live-donor transplants per week in addition to a large volume of cadaver kidneys. Our pediatric renal replacement program is world-renowned, and we have done more pediatric transplants than many pediatric hospitals. 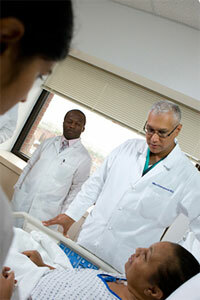 The patient and graft survival rates in the pediatric population are superior to the national average. In addition, transplantation of the elderly is among our special interests.